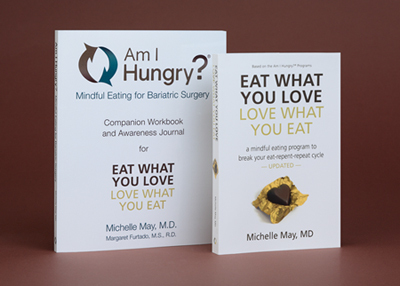 Mindful Eating for Bariatric Surgery Resources - Am I Hungry?Am I Hungry? Bariatric surgery is a tool, not a quick fix. Here are additional tools for your tool box. Whether you’re aware of them or not, you probably have a tendency to repeat certain cycles in your eating. Since you can only change patterns that you’re aware of, this Eating Cycle Assessment is a powerful first step toward meaningful transformation. Mindful eating skills help resolve the mindless habits and emotional eating issues that commonly lead to problems after bariatric surgery. Take a sneak peek then order your set here. Receive a monthly eye-opening and inspiring article by founder Michelle May, M.D. Subscribe to our complimentary motivational e-newsletter and you’ll also receive “101 Things to Do Besides Eat.” Simply start your monthly subscription by filling out the form in the sidebar. You may also browse through our previous issues here. Download "It's STILL Not About the Food: Mindful Eating After Bariatric Surgery."